Betsy L. McCoy is thrilled her employer is feeling as at home in the Tampa Bay area as she does. 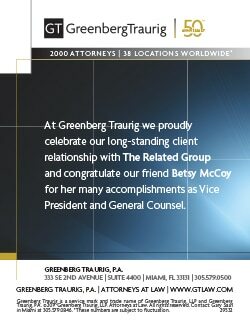 For prior to becoming general counsel and vice president for The Related Group, Florida’s most recognized development company, McCoy was a long-time principal and shareholder in a Tampa law firm. There, she made a name for herself as a business litigator and all-around problem solver—attributes that have proven indispensable in a market that is experiencing unprecedented growth and a slew of new development projects. While McCoy doesn’t get overly involved in the land-use end of things, she does assemble and manage the legal teams that do, and the past couple of years have seen her traveling back and forth between her Coral Gables home and Tampa, where some of the projects, either completed or in construction, have her thinking what a swell place the so-called Cigar City would be to live in again. The penthouse of Icon Harbour Island, a 21-story, 340-unit palace, and one of Related’s signature Tampa Bay projects, would suit her and her PGA instructor husband just fine, she says. But in the event it’s unavailable, Related has several other projects in various phases of development that while luxurious, are still within the reach of the many professionals who call the area home. 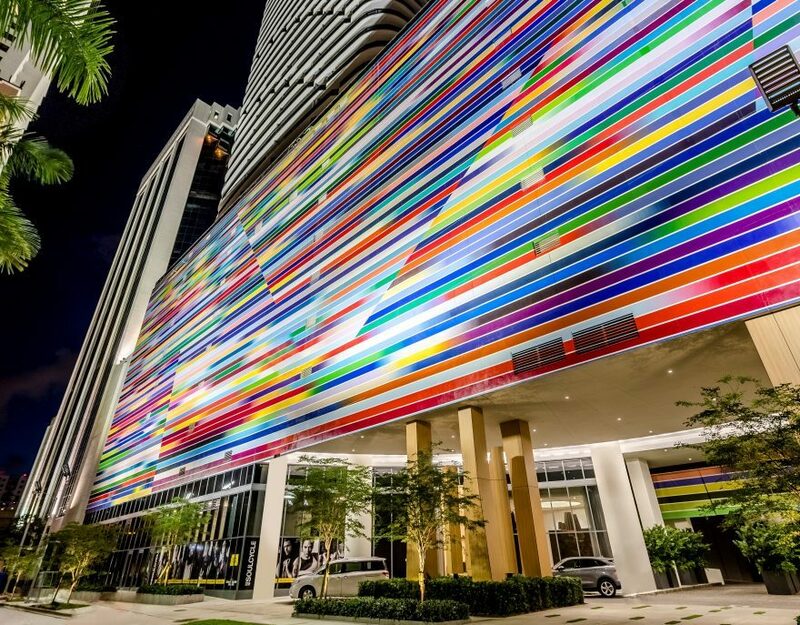 Most noted for creating the Miami skyline and for the museum-quality art collections installed in each of its developments, Related first made its mark in Tampa with the 2013 completion of Pierhouse at Channelside, a four-story, 356-unit, pet-friendly luxury apartment complex that McCoy says helped lead the revitalization of the Channelside district, making it extra appealing to well-to-do young people, the very demographic a progressive city targets. A success by any metric, Pierhouse was sold to Florida’s pension fund for $76.5 million, a year after its completion, further inspiring Related to expand its Tampa footprint. The aforementioned Icon Harbor Island could be mistaken for the most exclusive hotel in Palm Beach, with its Parisian-style architecture and interior amenities, including a parking garage, deluxe lounge, movie room, business center, private dining room with wine cellar, game room with bar, fitness center with spa and massage room, and pool with cabanas and a gazebo. The rental units have one, two or three bedrooms. Another upscale waterfront project is planned at the west end of Tampa Bay, where the financial crisis of a decade ago preempted a previous developer from bringing its plans to fruition. Called Town at Westshore Marina District and located at the site of the former Imperial Yacht Marina, it too will be a rental property with commercial uses at the corner of West Shore and Gandy Boulevards, the latter of which leads to a bridge over Tampa Bay and into the vibrancy of St. Petersburg. There, Related is developing Icon Central, an $80 million, 15-story, 368-unit mixed-use rental property that will help breathe new life into the West Central Avenue business district. Back in Tampa, Related’s affordable housing developer RUDG, LLC was selected by the city to redevelop a 20-acre public housing community along the Hillsborough River. Beating out five other bidders, Related will undertake the creation of an entirely new community of mixed-income housing and business opportunity, by demolishing and rebuilding North Boulevard Homes, Tampa’s oldest public housing project, and the Mary Bethune High Rise Apartments for senior citizens. And, with digital news having outpaced traditional newspapers, the property of the defunct Tampa Tribune became ripe for redevelopment, which led Related to purchase the high-profile parcel. Now the firm is replacing the venerable Parker Street building with Manor Riverwalk, another mixed-used property with a variety of highly desirable residential and commercial units, bordering Tampa’s downtown Hillsborough River Shoreline. In some ways, McCoy is picking up where she left off years earlier; she spent two decades in Tampa between the late 1980s and 2007, and during that time saw—as the local boosters termed it—“America’s next great city” emerging. Then, in the late 1980s and the early 1990s, it seemed that the road ahead was a long one, recalls McCoy. Among McCoy’s friends was Sandy Freedman, who served as mayor between 1986 and 1995, oftentimes enduring sharp-elbowed ridicule from the Tampa Tribune and St. Petersburg Times over her commitment to major downtown projects that critics deemed were at the expense of neighborhood upgrades. But to Freedman, and supporters like McCoy, the vision for amenities such as a convention center, sports arena, art centers, the Florida Aquarium and international hotel brands weren’t just intended as playgrounds for the wealthy; these were part of a larger strategy to develop an urban infrastructure that would, in time, make Tampa attractive to spinoff investments that would lift all boats. It’s a vision that has been shared by most of Freedman’s successors, including McCoy’s friend, incumbent Mayor Bob Buckhorn, who was Freedman’s chief of staff and now leads the redevelopment set in motion all those years ago. Of course, McCoy is well-equipped to help realize this vision for Tampa. 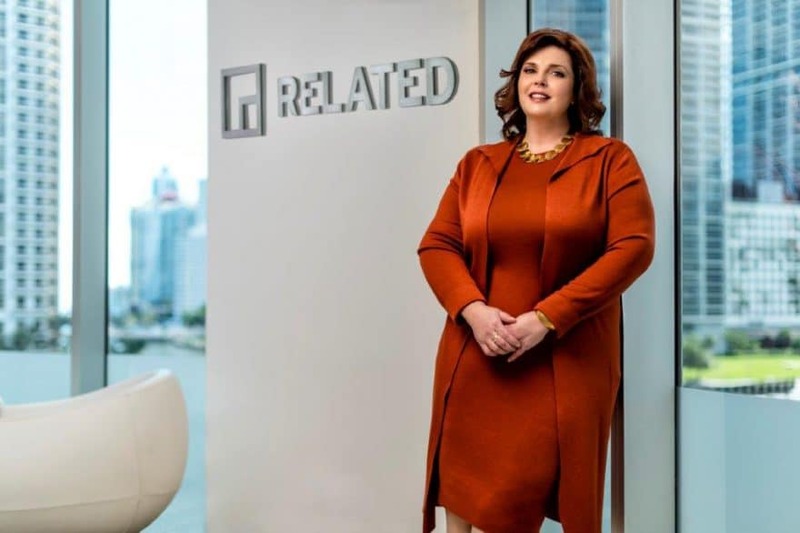 She’s a rarity in the Florida legal world—her Creighton School of Law degree and her University of Miami LLM in the law of property development augmented by certification from Harvard Law School. She is also board-certified by the Florida Bar as a specialist in complex commercial and business litigation. Upon joining Related, she anticipated—well ahead of the financial crisis— that Florida’s condo glut would leave banks with many loans to restructure, booms inevitably being followed by busts. Although more than 3,000 claims rolled in against Related during the 2007 and 2008 real estate market collapse, McCoy shepherded the firm through the various pitfalls which put nearly all other developers down for the count. That storm has long since passed, with Related relaunching development efforts in 2012. The firm looks to continue to grow with the Tampa area, and help the region achieve its full potential.